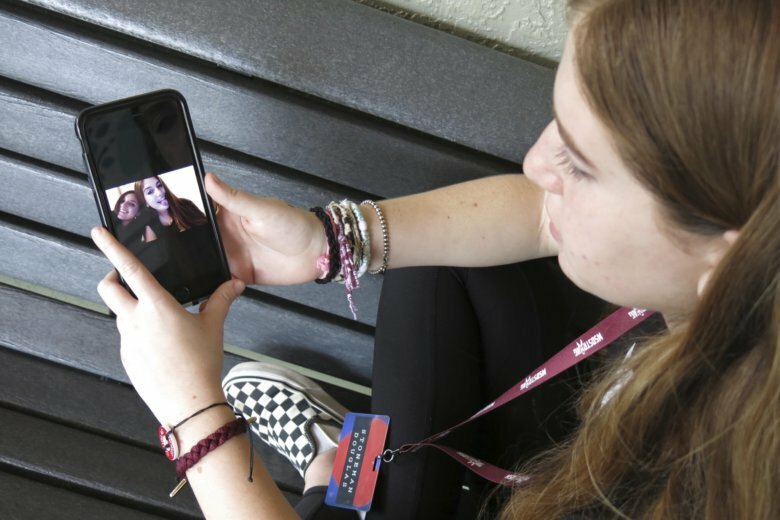 Most of the 3,000-plus students at Marjory Stoneman Douglas High School are coming to terms with the trauma in quieter ways — writing poetry, filming documentaries, reconstructing the crime scene and trying to balance memories with the need to move on. The community at Marjory Stoneman Douglas has become best-known for the handful of charismatic students who’ve channeled grief and outrage over the Feb. 14 shooting to reignite the national debate on gun control. But most of the 3,000-plus students are coming to terms with the trauma in quieter ways — writing poetry, filming documentaries, reconstructing the crime scene and trying to balance memories with the need to move on. The attack that claimed 17 lives began in the hallway outside Hebron’s honors English class. No one had time to take cover. Two of her slain classmates tried to hide under the same classroom table that shielded her. In the shower, she sometimes feels as trapped as she did that day, when she witnessed the death of her best friend, 14-year-old Alyssa Alhadeff. If the poem helps express her pain, a new tattoo illustrates her efforts to move forward. While on spring break in Israel, she had a heart-shaped stem with flower petals and the classroom number drawn onto her left leg. Freshman Samantha Deitsch also used poetry to document her shock at the loss of her 14-year-old friend, Jamie Guttenberg. The poem helped her persuade her older brothers, who are among Marjory Stoneman Douglas’ leading advocates for gun control, to include her in their advocacy with the Never Again group; they initially excluded her, trying to protect her from online trolling. “They wanted to kind of make things normal for me and let me go to school,” Deitsch said. But there’s little normal about attending class with clear backpacks, armed guards and checkpoints where students must show IDs. “I’m going to be in this school for three more years, and I don’t want to be sitting here in silence,” Deitsch said. A student-led project “Stories Untold” is recording details from the shooting in video interviews. Project member Giuliana Matamoros, a junior, said the gun control movement that now seems headquartered in Parkland needs more voices for success. “Without the stories, without the vivid details, they won’t know how traumatizing it is to see all that stuff,” she said. Junior Ivanna Paitan has conducted “investigations” with classmates in her Advanced Placement Psychology class, where she’d been trapped by gunfire under her teacher’s podium. In long discussions, sometimes during class, students delve into every detail of the shooting. Their investigations have produced a reconstruction of part of the crime scene — a hand-drawn layout of Room 1213, with squares illustrating desks, tables and other classroom fixtures. Dotted lines cross most of the page, beginning at the classroom door in one corner and covering most desks, illustrating the spray of bullets that trapped Paitan, injured three of her classmates and killed a fourth student. Paitan carries the image on her phone and displays it as the easiest way to relate what happened to her. She said she sometimes dreams she’s caught in another shooting at school, scrambling to hide from approaching gunfire with her friends yet again. Some students have a hard time articulating exactly how they feel about returning to a campus that had been a killing zone. Junior Samantha Grady was injured by gunfire alongside her best friend, Helena Ramsay, who died while trying to shield her. She’s found little ways to keep her friend’s memory close: wearing a lip gloss Helena gave her, and listening to the K-pop songs Helena introduced her to. Talking on a sunny day in a Coral Springs park, it was easier for Grady to slip back into the moments right after the shooting, when she was being treated at a hospital and still hoping her friend survived. She had sung the hymn “God Will Take Care of You” to comfort herself then, and she hit its high notes without faltering while singing the first two verses in a recent interview. Reconstructing their experiences of Feb. 14 can be cathartic as students try to make sense of their brushes with death, according to psychiatrist Dr. Francisco Cruz, who’s affiliated with the Florida-based Ketamine Health Centers. “Those that are able to do that are able to get through the experience much better than those who isolate and avoid … the ones that aren’t willing to confront it,” Cruz said. But he warned that reliving the experience also can be re-traumatizing if not done in a therapeutic way. For a number of students, talking about the terror that day offers a way to honor their fallen friends, to bring home to outsiders the enormity of what was lost and just how much has changed at Marjory Stoneman Douglas. “Before all this, nobody knew where Parkland was. … I think we were a pretty cool school. We had our moments. It was fun,” junior Kyrah Simon said.